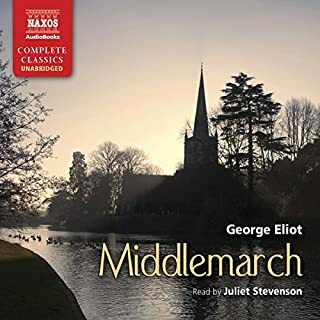 After listening to Juliet Stevenson read Middlemarch, I was longing for something more from both Eliot and Stevenson. Happily, I found this novel. The story itself is not quite as tidy as Middlemarch, but that might make me like it all the more. 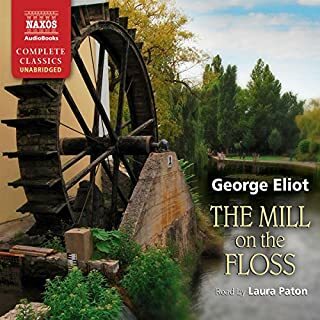 I hope miss Stevenson will find it in her heart to read "Mill on the Floss" next. For myself and countless others, she has provided a new window into the classics. I love Middlemarch and this story has same wit and many of the same themes. Plus Juliet Stevenson is an amazing reader; I have listened to many books just because she reads them. I feel grateful that she does this work! Good narration. Compelling characters and interesting story, but painfully slow at times. I wanted to read it though so I am thankful for the audio version! As fresh and insightful about the human condition as ever. Two intertwined narratives about two young people searching for meaning and identity. Perfectly performed. A pleasure. 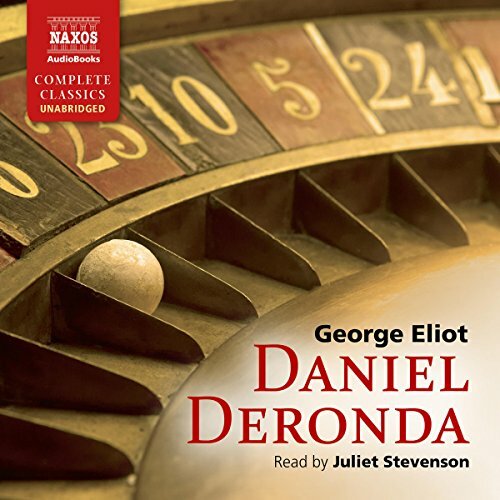 Daniel Deronda by George Eliot surprised me at how much it moved me. Having just finished the audio book of Middlemarch which I liked very much, but which did not move me in the same way, I was slightly reluctant to begin Daniel Deronda. But the story is so utterly fascinating and so enriching and beautiful that it really did take me to places beyond those I experienced in Middlemarch. It's a very emotional journey of this man Daniel Deronda who finds himself and his heritage to be exactly what he would have wanted, in Judaism and Eliot tells it with such painful considerations to all those involved that you can't help but be utterly broken. And Gwendolyn the other side of this novel, so different from the good, decent, moral and caring Deronda and yet wanting to be. She is left to rebuild a broken life stunted by an evil husband who she seemingly lets die and is left with a meager inheritance to do some good with, as she says, in trying to be good in her new life. 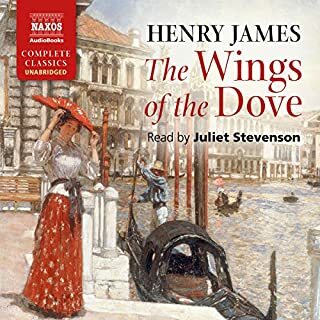 Juliette Stevenson reads all the characters with richness and vigor and makes them as real as any I've heard on audiobooks. She elucidated the novel through her performance and I throughly enjoyed her. An absolutely monumental work, that should be part of everyone's life. 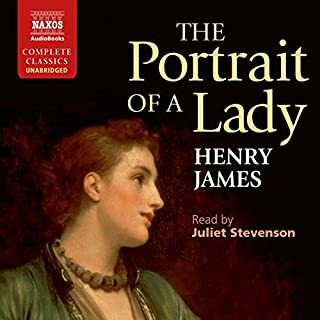 There are so many brilliant sub-plots and so many deeply thought-provoking characters, and Juliet Stevenson offers a typically great reading of this masterpiece. You must listen to this! 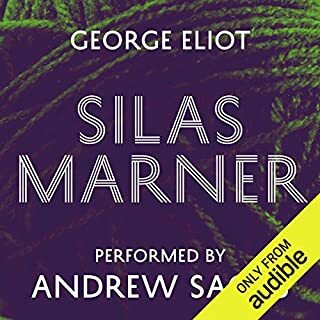 loved this, my first George Elliot. Juliet Stevenson's vibrant reading brings it fully to life. This is a great book read incredibly beautifully with great vocal characterizations and accents. I found it hard to get into at first but it’s worth hanging in there. George Eliot is both philosophically and psychologically profound and also creates compelling plot twists that draw you in. This classic novel takes a long time to unfold and requires great reading stamina but Juliet Stevenson creates an immersive experience with her perfectly nuanced reading and nearly 40 hours of imaginative delight have been delivered. It is impossible to praise the reading highly enough. The romantic entanglements and class consciousness are wittily observed. Nothing goes unnoticed by Eliot's sharp satirical eye. The haughty provincial dowagers and snobs are skewered hilariously. George Eliot explores areas of esoteric Hebrew scholarship which are exotic and strange to the modern reader but the subtlety and depth of her characters and her penetrating insights into human behaviour make it an extraordinary book. The prose and poetry of the writing is perfectly cadenced and arresting sentences keep occurring, sometimes needing to be heard twice. I don't think reading the book would have given the emotional rewards of listening to this extraordinary narration. I was especially struck by the reunion of Deronda , in Genoa, with the mother who abandoned him as a child. She is an astonishingly vivid character who must have shocked Victorian readers. She counterbalances the Zionism of Ezra and Klessmer the musician represents the urbane non religious Jew whose status is defined more by art than race. This book articulates the yearnings of european Jews as a stateless people and it is remarkable that it was written by a non Jewish British woman. I preferred the romantic tale to the religious visionary aspects but the novel is a monumental achievement. Strangely, to me, Daniel Deronda is not the most vividly drawn character in the book. Juliet, O Juliet thou art a Great Witch! Elliott has always been a great but difficult novelist for this 'unlearned' listener & were it not for the immeasurable talent of the immortal Juliet, Daniel Deronda would have been relegated to deep storage. How is it possible for a mere mortal to create & maintain such a varied range of ages, genders classes (accents)? Surely, here be Sorcery! And not of the mediocre kind. Voice training is all very well but the prodigious kinesthetic & cerebral memory required of the vocal musculature & it's neurological sophistication as exhibited here depicts great mastery. When Daniel finds out the truth about his birth parents and travels to Genoa to meet his birth mother for the first time before she dies. Hans was a great character and it must have been a challenge for Juliet to portray his many facets of personality. I can really empathise with him and it's probably true to say that,even today, most of us know or have known a 'Hans'. He is poignant in his attempts to try and cover up his pain and tender feelings with false levity. He is charming and erudite, a free thinker, a fish out of water, perplexing and unpredictable. A childlike sweetness,but very clever and deep nature. Misunderstood and much loved by his mother and sisters. I really liked him. Oh yes, but too much to take in. It merits a slow listen. What an amazing subject matter for George Elliot to decide to write about. The history of the Jewish people and the prejudice that they encountered at the time of her writing, was both fascinating and shocking. I now most definitely need to research why this was a subject she wished to tackle. I am certainly glad that she did! An unforgettable novel brilliantly read by Juliet Stevenson. These characters will stay with me forever . Although very long so many issues are covered one's interest is held throughout. The language is beautiful, enhanced by the way in which it is read. A moving and uplifting book. If you could sum up Daniel Deronda in three words, what would they be? Not quite as good a story as Middlemarch but more philosophical. Juliet Stevenson is just an unbeatable narrator. She will spoil you and you won't want to listen to anyone else. Gwendolen's unlikable character was strangely enjoyable and amusing, her speech was fantastically portrayed by JS. Not sure I would have read this book but to hear Stevenson reading it aloud has bee mesmeric. Plum full of metaphor and simile she annunciation every word perfectly adding modern resonance. Brilliantly narrated to bring it to life. The quality of writing is exceptional and so perceptive. 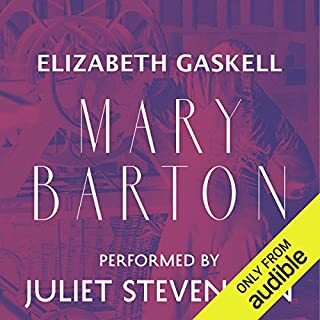 I've just discovrred George Eliot and Juliette Stevenson is the best way to hear more. Brilliant story with a complex cast of characters all drawn with deep psychological detail and empathy. Juliet Stephenson reads this wonderfully with a vocal range of exceptional ability which is a delight to enjoy. The plot thickens and deepens as the book progresses, building up to its intense and satisfying ending. I know that not everyone likes Daniel Deronda, and that some consider it George Eliot's weakest novel. It's certainly one of her most overtly political, and the long treatise near the middle about the condition of Victorian Jews is very hard going. However, I loved this novel when I first read it, and Juliet Stevenson does an outstanding job with a complex cast of characters with wildly varying personalities. Deronda is skilfully drawn as a young man who is out of step with his world but can't work out why. He is an outsider who loves and respects the environment he doesn't belong to, and he has a hard time finding space to explore his own vision of life. Gwendolen is a good person who's been brought up to be selfish and domineering. Her tragic life sets her on a path to change, which I think is both believable and extremely poignant -- she demonstrates that a certain sort of human nature is formed for the better through suffering. Mordecai is one of literature's most challenging characters -- a true prophet marginalised by his people. I am affected every time by his conviction and his belief that the world can be changed for the better. This novel is a long road that starts slowly (like most Victorian novels...), but in my view it will change your life if you're the sort of reader who wants to see questions that matter dealt with by real people who aren't perfect. I read Daniel Deronda many years ago as a 20 year old. i loved it then. Reading it now at 70 I am overwhelmed at it’s scope, elegant prose, it’s understanding of the human condition, and the unusual way she can hope back and forth in a characters mind and the reader is never lost. I have come to the conclusion that George Eliot is one of the most wonderful writers I have ever read. This book is sheer genius.